Leather Seats, Heated Seats, Heated Steering Wheel, Rear View Camera, Power Tailgate! With high-quality interior features and the latest technology, you'll never want to step out of this stylish, comfortable Audi Q7. This 2014 Audi Q7 is for sale today in Langley. When designing this Q7 three-row crossover, Audi set out to craft a vehicle that not only has available advanced technologies and luxuries that make for a near perfect sanctuary but is also thoughtfully shaped to transcend trends and remain timeless. The result is a roomy, comfortable, luxurious SUV with power and sophistication in equal measure. This SUV has 78643 kms. It's white in colour. It has a 8 speed auto transmission and is powered by a 280HP 3.0L V6 Cylinder Engine. This vehicle has been upgraded with the following features: Leather Seats, Heated Seats, Heated Steering Wheel, Rear View Camera, Power Tailgate. Our Q7's trim level is 3.0T PROGRESSIV. 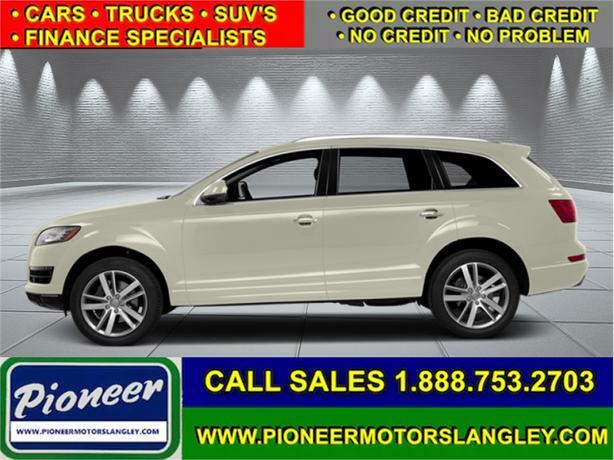 This Audi Q7 delivers both luxury and performance in one attractive package. It comes standard with an Audi multimedia interface with Bluetooth and SiriusXM, 11-speaker audio, leather seats which are heated in front, a heated, leather-wrapped steering wheel with audio and cruise control, a power liftgate, a rearview camera, and more.